It's the largest mode in the game. Years ago, when Star Wars Battlefront 3 (prior to the reboot) was in development at Free Radical, the studio experimented with seamless planetary and space battles—you could be fighting on Tattooine while your mates were above you, grabbing a Tie Fighter from a Star Destroyer. It was cancelled and we never got to try it for ourselves. 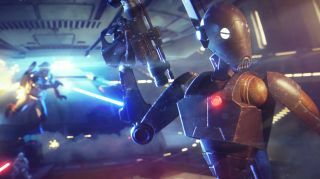 The upcoming Capital Supremacy mode for Star Wars Battlefront 2 doesn't go quite that far, but it will let you fight on Geonosis and then board a capital ship that's hanging out in orbit. Capital Supremacy is the largest Battlefront 2 mode, or will be when it launches next week, not just in terms of scope, but number of combatants, too. While the actual player count will be 20 on each team, they'll each be bolstered by 12 AI-controlled units during the ground phase. The team decided not to expand the player numbers beyond Galactic Assault as they wanted players to have a better chance of taking control of a hero. To start with, both teams will duke it out on Geonosis—a different version from the Galactic Assault and Heroes vs Villains map—and fight over five control points. These points generate tickets, and when a team has enough, transports will be summoned to take them to the capital ship. The more troops that make it onto the transport, the more tickets the team will have for the assault. The ship battle is split into two phases, starting with the attackers trying to override doors and followed by the fun bit: planting explosives. If the attackers' tickets run out before they finish blowing stuff up, however, the battle will return to the planet and both teams will start racing to the opposing ship again. I've been really impressed with Battlefront 2 over the last year. I never in a million years would have though more Clone Wars stuff would make Battlefront 2 a better game, but so far it has, and while Capital Supremacy might not seem quite as audaciously ambitious as Battlefront 3, it still sounds like a twist with potential. You'll be able to play Capital Supremacy on March 26, and it looks like more Clone Wars updates are coming.